To quote Keith Jackson, “WHOA NELLY!” What a game Monday night! Apparently a month of planning from Coach Tressel can help the Ohio State Buckeyes make a game against the Texas Longhorns. The McCoy/Crosby connection toward the end of the game reminded me of the Harrell/Crabtree connection made from Texas Tech earlier this year. The Longhorns eeked out of the Fiesta Bowl with a win and the Ohio State Buckeyes go home a BCS bust (again). The game gave us a preview for next year, as we know now that Sam Bradford from Oklahoma is going to the NFL and Colt McCoy is coming back. Can you say preseason number 1 Colt? The Longhorns will be the favorite next year even if Tebow comes back to play in Florida. Oh, and for the last bit of Longhorn loving you’ll see from me in awhile, you might as well tack on a Heisman for McCoy too. Especially if he keeps those percentages up. On the flip side, the Ohio State Buckeyes go home a loser yet once again this year. I’d say they should’ve put Penn State in the game instead, but they got a whuppin’ from USC New Year’s Day as well. So they played the Longhorns tough. Are they coming back strong next year? Nope. Many seniors this year came back to try to win the title this year. I see them going down. Fortunately, they are in one weakest conferences in college football. The Big 10 went a paltry 1-6 in Bowls this year. Even the WAC did better this year. You know it’s a sad year for the conference when Iowa is the only winning team from the bowl season. As much as I’d hate to say it, the Big 10 is nothing without Michigan. Now that Rich Rodriquez is through his typical Freshman Funk, look for the Big 10 to bounce back somewhat next year. The Big 12, on the other hand, looks to be going strong. They’re losing people but gaining some in return. There’s always Texas and Oklahoma, but the South now has a couple of big time programs coming around. Texas Tech kept the Mad Scientist and Oklahoma State gets more dough from Boone Pickens so look out. Maybe Baylor will come back and maybe Texas A&M will realize who they are. Or one of them can be replaced by TCU. The North saw a decent return to power from the Nebraska Cornhuskers, Kansas wins two bowls in a row, Missouri made up for another big game choke (even though they’ll be down on the loss of Chase Daniels), and K-State brings back Bill Snyder of all people. It means something when a winless conference coach in the North leaves and coaches AUBURN of all teams. The Big 12 is 4-2 behind the undefeated Pac 10 of all conferences and 5-2 SEC with one game to go. Tonight’s game is for the big shiny glass. Oklahoma is taking on Florida in Florida’s home state of, yup, Florida. Mismatch you say? I’m not sure. Putting up 60 points the last couple of games is a good way to keep the momentum going. What defense? Okay, they are playing better as well in the last couple of weeks, but they are not going to stop Tim Tebow. 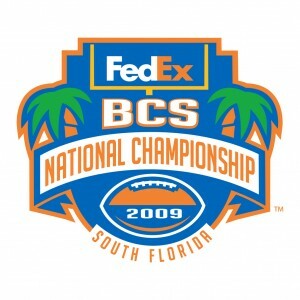 Maybe if they beat up Percy Harvin, they would have a chance but then again Florida topped Alabama without Harvin. So it sounds like it will be a real shootout. Who’s gonna win? Well if we followed the Bowl Pick ‘Ems I can say that Oklahoma is going to win. If they do (and Wharfrats somehow picked Florida) I win the Bowl Pick ‘Em Challenge! Of course I have other reasons to go with the Sooners, the main being that they are Big 12 boys. Going with my head tells me it’s the last team who has the ball in this one. Let’s hope Florida comes out cold because that will be the only way Oklahoma will win. BOOMER SOONER! No sooner than you thought I would be done, I did want to mention that the title spot will be a JJ’s Other Place. Maybe I’ll take some pics and pen up a review, but more than likely I’ll save that for the regular season. Chances are I will be logging on from the bar internet computer and tossing out a few comments. Hey it’s the only sports bar in town with a usable internet computer. Come on down tonight at 7:00 pm at JJ’s and enjoy the best damn sports dive this side of the Wyandotte County border.